In January 2015, we responded to a legislative attack on net metering in the state legislature. Net metering is the bedrock policy that allows solar homes to reduce their electric bills by the amount of energy they produce. The state House and Senate were considering legislation to repeal the state’s renewable portfolio standard (RPS) and net metering rules. 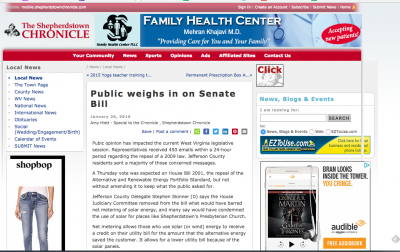 Hundreds of homeowners submitted comments to their legislators to support net metering. We quickly pulled together a steering committee, identified key players, and put together a campaign focused on the state’s solar energy activists. We generated more than 1,000 public comments on the issue in two weeks and, as a result, many legislators of both political parties emphasized their commitment to protecting the bedrock solar policy of net metering. In a press release, the governor underscored the increasing role that solar is playing in West Virginia and acknowledged the importance of new solar jobs. In response to the proposed legislation, the Public Service Commission created the Net Metering Task Force and charged it with determining whether or not non-solar customers are subsidizing solar customers. Our board member, Cathy Kunkel, served as an expert on the task force. Along with other solar advocates, Solar United Neighbors of West Virginia (known then as WV SUN) argued that there is no cross-subsidization and that, conversely, if studied closely solar customers provide a net benefit to the grid, the utility, and other customers by providing power at times of peak demand. The PSC staff attorneys agreed with the solar advocates that this cross-subsidization is a non-issue and did not require further action by the Committee. Until 2015, West Virginia’s solar community had not come together to speak with one voice. Public conversations that developed around solar power were usually framed in the context of the state’s environmental movement and were considered polarizing in coal country. Solar installers had a legislative presence, but they lacked strong vocal support from the broader community of solar power producers. Thus, 2015 was a watershed year in a coal state as solar became a populist issue supported at least nominally by both parties. To make the shift, we cultivated a robust grassroots network by helping people go solar in their communities. The networks we have been creating have become powerful tools to support policy change and defend critical solar policies. Our broad base of solar supporters and co-op members, educated through our extensive communication network of newsletters, listservs, and community outreach, were ready to take action when West Virginia’s legislature attacked their fundamental right to net metering. And we’re continuing to build our base to protect against future attacks like this. The networks we have been creating have become powerful tools to support policy change and defend critical solar policies. “Just a reminder of the importance of keeping the net metering authorization that a portion of this bill would eliminate. West Virginia is at a threshold in advancing sustainable energy systems, and this would be a huge setback. Many individual West Virginians have invested in solar systems to not just serve their own needs, but to serve in a bigger goal to reduce our dependence on limited resources. Please remember them when you vote! “I live in Alderson, WV, in the beautiful Greenbrier Valley. I own a small business (11 full-time professional employees). I have recently purchased a historical bank building and plan to open several businesses, investing significantly in the town. As part of the business, we have developed a solar energy plan and build-out. We are about to begin construction, developing one of the few solar energy powered businesses in the region. Regardless of your stance on the issues, net-metering is the only way that makes investing in solar projects viable.